The films of Georges Méliès are always busy. They were born of a theatre tradition that was itself outsized, loud and flamboyant. Minus sound, those tendencies became even more extreme. But they worked, often memorably. In the hands of Méliès—a genius designer of sets and costumes, and a magician both onstage and in-camera—these short films set a bar for artistry and imagination that in some respects has never been exceeded. We could produce a long, smug list of the ways Méliès movies seem primitive today: starting with the fixed camera, anchored, always, at medium distance. But the director’s designs remain first-rank; and he knew, most of the time, what his manic little films were truly about. That last part is key. A Trip to the Moon (1902), and The Impossible Voyage (1904), for all their lunacy, have characters fixated on goals. Those characters are fools, yes, but their intentions are clear enough. It is their attempts to make their dreams come true that generates the spectacle. By this measure, The Merry Frolics of Satan doesn’t quite succeed. Another of Méliès’ quest films, it too concerns a man of science, embarking on a Jules Verne-style journey, encountering bizarre obstacles along the way. But we get little sense of who this man is or what he hopes to achieve. And it is surprisingly damaging to the film. In A Trip to the Moon, astronomers design a shell and launch it into space; their battles with the Moon Men are a result of where they land it. In The Impossible Voyage, the crew’s near fatal series of mishaps are the result of an inventor’s hubris—he designs a craft he believes capable of traversing any terrain, including orbit, and is proven wrong. These men and women are proactive in their folly. The engineer and his assistant in Merry Frolics are simply reactive. Uncertain how to proceed with their fuzzy quest, they visit an alchemist, who presents them with a basket of giant pills. Throw a pill on the ground, he demonstrates, and a girl appears, in a puff of smoke. Though such a pill has obvious advantages, especially on a long and lonely quest, little more is made of it. The point is the trick. (And the girl. Few Méliès films conclude without an appearance by at least one pretty girl). The alchemist is, in fact, the Devil, played by Méliès himself. The director’s clearly having a ball in his red get-up, commanding demon-troops with exaggerated pointing that makes him look like a weather-vane from Hell. Being the Devil, his purpose is not to help the scientists, but to hinder them, before finally consigning them to damnation. So this is Faust; not Verne. And there is no real quest, only a ruse--a succession of frustrations, leading to unavoidable failure. “Leave alone your ridiculous machines and follow me to my master,” says the Devil’s emissary, who promises them not some secret knowledge, but simply a talisman. Verne would have hated that. The engineer's only decisive move is to sign the contract that destroys him. Until I saw Merry Frolics, I would have laughed at a critique of character motivation in any Méliès film, but even in these bizarre shorts, it does seem to matter. In his better films, Méliès presents us with men who build vehicles; but here, it is the men themselves who are vehicles--for the gags and stunts. Some of them are great, mind you: particularly the various ways the men are denied food (a nod, I suppose, to the myth of Tantalus); and the box-train: an elaborate piece of performance art in which new-conjured servants rise out of chests, pull smaller chests out of larger ones, and transform them into train cars. But these scenes would work in any film, or on their own. Later, during an overlong battle sequence between Satan’s minions, a pair of chefs, and a pair of apes, I realized that I’d forgotten about the engineer and his assistant entirely. They were still onscreen, huddled in a corner, watching the action, just like me. They were not relevant. 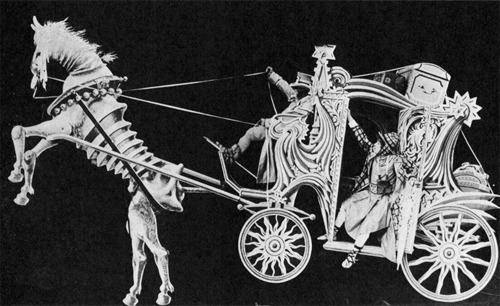 The best sequence in Merry Frolics is one of its last: a demonic carriage ride through the heavens. The carriage is gilt with designs suggesting infernal things, and it’s pulled by horse that appears to have died about a week prior. The horse is a remarkable puppet, actually: though its body appears skeletal and stiff, its head, pulled by the reins of a driver, moves in a lifelike way. It’s one of Méliès’ better illusions, and that’s saying something. The engineer does not choose this ride, and predictably, it ends badly for him. As badly as possible. The fragments of his carriage plunge toward the earth, and Satan finally collects what he’s owed, dragging him to Hell and roasting him on a spit. This isn’t played for laughs. In fact, it’s gruesome. And it’s really a bit disconcerting to see Méliès employ his talents this way. Not that I’ve got a problem with dark endings, mind you; I just want consistency of tone, and The Merry Frolics of Satan seems to be missing that too. 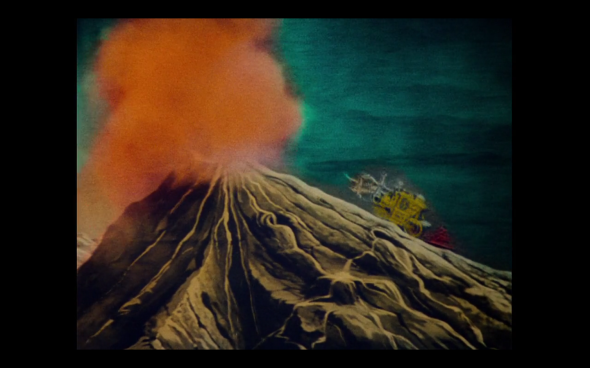 The film has an unusual history. The story upon which it was based was first performed onstage, in Paris, in 1839. It was revived in 1880, and again in 1905; this time incorporating film footage produced by Méliès. That footage was the carriage ride. Méliès later filmed the rest of Merry Frolics around it. 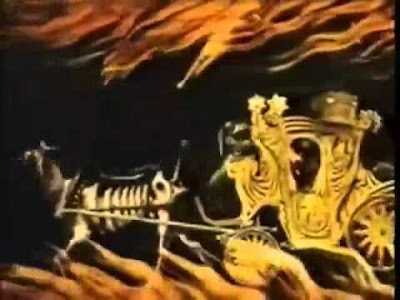 The Merry Frolics of Satan runs 17 minutes, making it one of Méliès’ longer works. It’s fast-paced and fun and simply too short to give you time to get bored. Over the course of that quarter-hour-plus you’ll be treated to some remarkable (for the time) special effects, remarkable (for all time) sets, and a series of stage tricks that would entertain even if there were no plot surrounding them. That’s the problem, really. But it’s also the film’s greatest strength. The Merry Frolics of Satan, also called The 400 Tricks of the Devil, can be found on disc three of Flicker Alley’s magnificent five-disc set, George Méliès: First Wizard of Cinema (1896 – 1913). This print is partially hand-coloured, and includes voice-over narration. 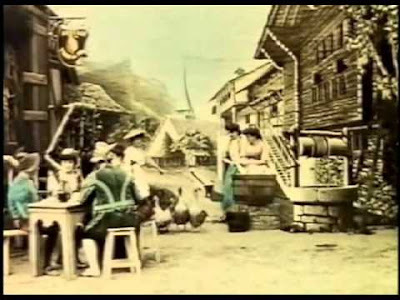 Narration was a common story-telling technique at the time, and is necessary for Méliès’ films, which have no intertitles.